cost. Departing our Holland Street Center at 9:15 A.M. with an approximate return time of 4:00 P.M. Please contact Janine Lotti at 617-625-6600, Ext. 2300 to RSVP or if you should have any questions. Illumination of Lights – Saturday, December 13th – Join the SCOA, Teen Empowerment and the Somerville Arts Council for this intergenerational holiday lights tour. Departing City Hall at 7:30 – Seating is limited! Please call Janine at 617-625-6600, Ext. 2300 to reserve your spot or for more information. Illumination Of Lights – Saturday, December 13th – Join the SCOA & the Somerville Arts Council for its annual tour of the holiday lights in Somerville. There is limited seating – $5.00 fee – check-in time is at 4:15 P.M. at the High School concourse. Please call Connie at 617-625-6600, Ext. 2300 to reserve your spot. Multicultural Day – Wednesday, December 17th – At our Cross Street Center located at 165 Broadway – from 10:00 A.M. – 12:30 P.M. Learn more about different languages, music, foods and cultures. One day of international adventure begins with a music selections from the East Somerville Community School chorus, delicious food samplings, various exhibitors will be on hand to promote multiculturalism. For more information or to reserve a space please call Janine Lotti at 617-625-6600, Ext. 2300 before Wednesday, December 11th. Free Holiday Concert – Thursday, December 18th – At our Holland Street Center, 167 Holland Street – 10:00 A.M. Come and join the talented faculty members of the Powers Music School as they celebrate the season with old favorites from popular literature, and enjoy trying to “stump the band” by requesting a song the musicians may not know. The SCOA’s own senior choir, The Moonlighters, will be joining in on the fun as well. RSVP at 617-625-6600, Ext. 2300. Back by popular demand are the Holiday Inn Dances. Lunch and dance to music provided by Hank our resident DJ. All dances are on Mondays and from 11:00 A.M. to 2:00 P.M.
617-625-6600, Ext. 2300 to make your reservation or if you have any questions. It is the hope of both the Somerville Fire Department and the Somerville Council on Aging that we will receive the grant again in the future. If you would like your name put on a waiting list should this grant be received again, please contact Maureen Bastardi at the Somerville Council on Aging at 617-625-6600, extension 2316. All centers will be closed Thursday, November 27th & Friday, November 28th. There will be NO Dalcroze Eurhythmics the week of Thanksgiving. The luncheon at the Highlander Café scheduled for Thursday, December 9th is SOLD OUT. Holiday Party at the WHYC scheduled for December 10th is SOLD OUT. Huke Lau trip scheduled for December 16th is SOLD OUT. The Ralph & Jenny Center will remain closed on Mondays and will resume Mondays after the first of the New Year. Our Holland Street Center will be serving lunch on Monday, Thursday & Fridays only until further notice. LGBT Monthly Lunch – Monday, December 8th, 11:30 A.M., Somerville Cambridge Elder Services will provide a hot or cold lunch – suggested contribution of $2.00 – RSVP required no later than 2:30 P.M. Thursday, December 4th. This event happens the 2nd Monday of every month excluding City Holidays and snow emergencies. LGBT Advisory Group – Our next Advisory Group meeting will be on Monday, December 8th at 4:30 P.M. We are looking for new members and would love to have you as part of our group. This group meets the 2nd Monday of every month excluding City Holidays and snow emergencies. LGBT Dinner & Movie – Monday, December 15th – 5:30 P.M. meal time – This month we will be showing the movie The Family Stone and there will be a pizza & salad dinner served for a $5.00 fee. Must RSVP by 10:00 AM on Monday, December 15th. This event happens the 3rd Monday of every month excluding City Holidays and snow emergencies. LBT Women Fit-4-Life – Fitness and Nutrition Classes. Classes are Tuesday and Thursday evenings starting at 6:00 P.M. $10 a month fee – scholarships available & it just might be covered under your insurance. We have available slots and would love to have you. If you have any questions or require additional information, please contact our Health & Wellness Coordinator, Chris Kowaleski at 617-625-6600 Ext. 2300. All clubs and groups welcome new members. Men’s Group – Meets the first Tuesday of each month from 10:30 to 11:30 A.M. This group is facilitated by our volunteer, Norbert DeAmato. Are you recently retired? Looking to connect with other men in the community? Join our men’s group where you can connect with old friends and make new ones. All men 55 and over are welcome. Come chat about what is on your mind! If you have any questions or require additional information, please give us a call at 617-625-6600 Ext. 2300. Caregiver Support Group – Meets the third Tuesday of each month from 6:00 to 7:30 P.M. Our Social Worker, Natasha Naim, facilitates this group. Are you caring for a parent, relative, spouse or close friend? Feeling isolated or overwhelmed? You are not alone! Come share your experience and practical support. Open to all and new members are always welcome. If you are interested in joining, have any questions or require additional information please call 617-625-6600 Ext. 2300 and ask to speak to Suzanne. Veterans Group – Meets the third Monday of each month from 9:30 to 10:30 A.M. Our Social Worker, Suzanne Norton, facilitates this group. Are you a veteran? The Veterans Group is the perfect opportunity to socialize, have solidarity, to reminisce and to meet other veterans. If you are interested or require additional information, please call 617-625-6600 Ext. 2300 and ask for Suzanne. Low Vision Support Group – Meets the second (2nd) Tuesday of each month from 10:30 to 11:30 A.M. Our Social Worker, Suzanne Norton, facilitates this group. Do you know someone who has trouble seeing? Do you have low vision? Join our Low Vision Support Group for educational and informative information and peer support in a confidential environment. Lunch and transportation may be available on request. Please call Suzanne at 617-625-6600 Ext. 2300 if you are interested in attending, have any questions or require additional information. Current Events Group – Meets every Thursday from 10:00 to 11:00 A.M. Our Social Worker intern, Natasha Naim, facilitates this group. Join a group of your peers to discuss current events. Please call us at 617-625-6600 Ext. 2300 for additional information or if you have any questions. Book Club – Meets the first Friday of each month from 10:00 to 11:30 A.M. Senior Project Manager, Janine Lotti, facilitates this group. Join this group to read and discuss a different book each month. In most cases, copies of the book are available in the COA office. Contact Janine at 617-625-6600 Ext. 2321 or JLotti@Somervillema.gov if you require additional information. Gardening Club – Meets the second Monday of each month starting at 9:00 A.M. and running for an hour most times. Our volunteer, Vilma Sullivan, facilitates this group. A different topic each month ranging from gardening tips & secrets to inexpensive “greenhouses.” Please contact Senior Project Manager, Janine Lotti at 617-625-6600 Ext. 2321 or JLotti@Somervillema.gov if you have any questions or require additional information. The Moonlighters – Meets every Monday at 10:30 A.M. and runs September through June. Led by Somerville Youth Arts Coordinator, Jimmy DelPonte, the Moonlighters are an older version of the SunSetters. If you like to sing then this group is for you. Sometimes taking their skills on the road and this year The Moonlighters will be performing with the Powers School of Music for a Holiday Concert in December. Contact our main office at 617-625-6600 Ext. 2300 if you should require additional information. Brain Games – Meets the first Tuesday of each month starting at 10:00 A.M. This group is facilitated by our volunteers Eileen Jones & Jan Ciganelli. Engaging as a group in brain healthy activities. Proven that keeping the mind active can actually reverse the signs of aging and improve memory and cognitive functioning. Contact the main office at 617-625-6600 Ext. 2300 to sign up! English Conversations – Meets every Tuesday & Wednesday at 10:00 A.M. to 11:30 A.M. at our Cross Street Center located at 165 Broadway. Sandy Francis, our Cross Street Center Volunteer, facilitates this group. No books, no tests, no stress – just a great group of older adults from all over the world who help each other to listen, speak and learn English. Welcome to our centers! Everyone 55+ is encouraged to join us for fitness, culture, films, lunch and Bingo. 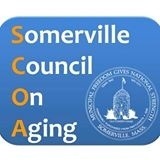 Our centers are open to everyone from Somerville and surrounding communities. Check out our calendar and give us a call with any questions or to make a reservation! 617-625-6600 ext. 2300. Stay for lunch and receive free transportation. *Monday through Friday 9:00 A.M. – 3:00 P.M.
*Our Holland Street Center will be serving lunch on Monday, Thursday & Fridays only until further notice. Tuesday & Wednesday 10:00 A.M. – 1:00 P.M.
**Monday through Thursday 8:30 A.M. – 3:00 P.M.
** The Ralph & Jenny Center will remain closed on Mondays and will resume Mondays after the first of the New Year. LBT Fit 4 Life*, 6:00 P.M. Fit 4 Life* Group A, 8:45 A.M. Fit 4 Life* Group B, 9:00 A.M. Fit 4 Life* Group C 12:00 P.M.
*All Fit 4 Life classes are $10/month and require pre-registration. You can receive our monthly newsletter that is always filled with useful and important information? For a $5.00 yearly fee, you can receive it via the U.S. Postal service or a free version can be sent electronically. Please contact Connie at 617-625-6600 Ext. 2300 to sign up.